On the West coast of the US we usually have deck lights on all the time. As so many of the boats have two decks like yours, the main deck lights don't interfere with above and there is usually a deckhand making round at all hours so the lights are also a safety matter. I think they look good two if amber in particular. 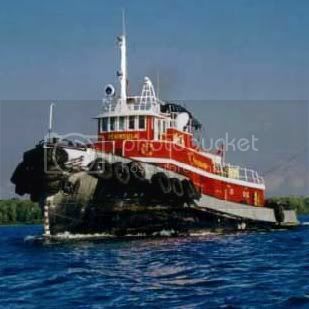 Anybody have any photos of what the steering telemotor and binnacle from a 50s/60s British-built tug would look like? Obviously they varied from boat to boat, just looking for something from that era to serve as a baseline. No problem, here's Meeching, built by Harris, 1960. I'd imagine much of the gear would be similar, if not identical. There was a steering indicator dial linked to the Telemotor and that will be attached to the next post. Here's the dial, just to the left of the Bloctube telegraphs. To the right of the dial was a bulb with a blue/purple coloured lens, with an engraved plate saying 'Steering Running'. Those are great photos. Dad looks like a jolly fellow! Thank you very much Meechingman, I was hoping that you'd have some photos! Looks like i wasn't far off on interior colour either. The only big difference is that my GA plans show a freestanding binnacle and only one telegraph. The compass and binnacle were (and still technically are) free standing, with the Telemotor gear a few inches in front of them. In Meeching's current form, the owners really updated the wheelhouse with a new forward 'dashboard' console containing all the gear, so it's boxed in. One man can now reach everything without moving too far from the wheel. As originally fitted, things were scattered all across the wheelhouse. MF radios at the rear, loudhailer/intercom to starboard, VHF radio to port, echo sounder to the rear and radar just in front of the radios. Definitely a two person job up there! As far as the GA plans go, don't take them as being 100% correct. Meeching's GA plans, though revised in 1966 for the copy I have, have numerous errors including the positioning of much of the wheelhouse gear! And yes, Dad was a jolly guy, and I'm glad to say that it rubbed off on most people who worked with him and knew him, me included! I'm only using the GA plans for 'basic' details, as I'm doing something from the 90's timeframe when Groupe Ocean owned the tug and had modernized and improved her quite a bit. I'm doing two joystick and throttle stations, one on each side of the wheelhouse at the front, plus adding in computer monitors and junction boxes for all the electronics. I don't know if I'll bother putting a wheel on the telemotor or a handle on the telegraph as these would've likely been disconnected by then and only kept around for show.